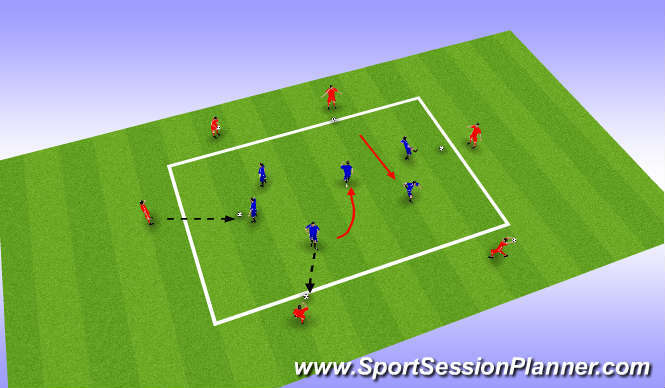 Organisation: Posistion 6 players inside the Square, and 6 outside, players on inside recieve a pass from outside players, then return the ball back and go and find another ball of a different player from the outside. Progress this to recieve the ball using the Knee, Chest, and both feet, each time bringing the ball down under close control, Both teams get to have a go. 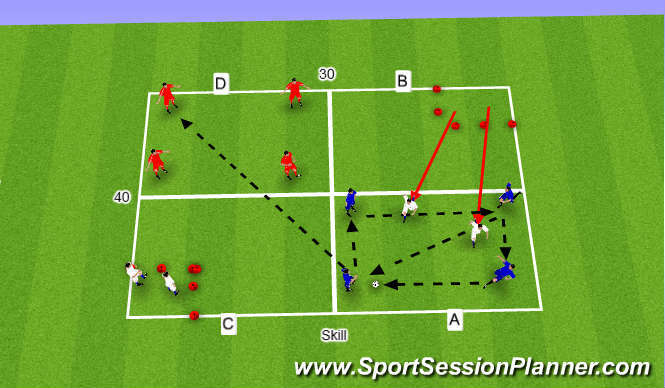 Organisation:The area is 30 x 40 and split into 4 giving each box a 15 x 20 area, Start with 3 teams of 4, Putting a Blue team in box A and Reds in box D while spliting the 3rd team Whites into smaller area 5x5 made in box B & C. The ball starts in box A, and as soon as first player touches the ball, The 2 players from box B are released to win the ball back creating a 4v2 game in box A. The blues aim is to make 3 Consecutive passes without letting the Whites touch the ball, Then they can Switch the ball to box D on switching the ball, the 2 Whites will return to their corner, And this releases the 2 whites in box C to attack the Reds, Reds are to do the same then return ball to Blues, this continues untill a white wins the ball, or a teams loses possesion. Which ever team the whites gain the ball off, they now take thier place in thier box, and the team that lost the ball now have to split and enter box B & C. defenders cannot leave thier box untill their team mates have got back to thiers.